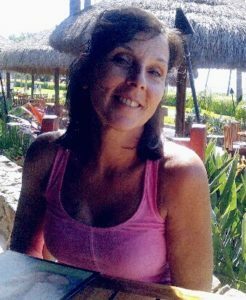 Ann M. Clark, 54, of Oswego died Wednesday November 28, 2018 at her home with her family by her side. She was born in Oswego the daughter of the late Donald and Concetta (Solazzo) Pelkey. Ann was a waitress at the Char Pit and later at Mimi’s drive Inn where she worked many years. Ann was a loving wife, mother and grandmother and will be greatly missed by her husband Vernon “Butch” Clark of thirty-five years, sons Vernon (Kendall) Clark of Fulton, Joseph (Thomas Souriya) Clark of Orlando, Michael Clark of NC, Andrew Clark of Oswego, and grandchildren Oliver and Elliott. Ann is also survived her brother Donald (Sally) Pelkey of Oswego, and sister-in-law Lisa Pelkey of Oswego, two aunts and several nieces, nephews and cousins. In addition to her parents she was predeceased by her brother Gerry Pelkey. Calling hours for Ann will be Tuesday from 4:00 to 7:00 P.M.at the Sugar & Scanlon Funeral Home 147 W. 4th St. Oswego, NY. “Butch”, I am sorry for your loss, my heart aches for all your family. I am sorry I couldn’t make it to calling hours, due to tests I had to take. Ann, has always been in my prayers. It was an honor getting to meet her, you and Andrew. I am very sorry that our ” friendship” didn’t last MUCH longer. You are in my thoughts.